Here in Applandia (as we like to call it) we’re always looking for ways that mobile technology can aid our faith. As such, we’re very excited to announce a new partnership with Dr. Scott Hahn and the St. Paul Center for Biblical Theology. Known for both his speaking and writing skills, Dr. Hahn is the bestselling author of numerous books including The Lamb’s Supper, Reasons to Believe, and Rome Sweet Home (co-authored with his wife, Kimberly). Some of his newest books are Many Are Called, Hope for Hard Times, The Catholic Bible Dictionary, Covenant and Communion, and Signs of Life. With his weekly Sunday Bible Reflections, Dr. Hahn offers inspiring insights into a fuller understanding of the readings heard every Sunday at Mass. His talks have been effective in helping thousands of Protestants and fallen away Catholics to (re)embrace the Catholic faith. A new “Reflections” button with Dr. Hahn’s weekly Sunday bible reflections is now available for your parish’s app. 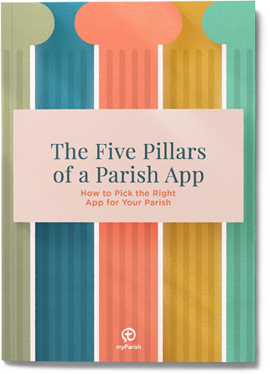 If you would like us to add this button to your parish’s app, please let us know. Be sure to also check out the other special features with great content for your parish’s app, including: Chris Stefanick of Real Life Catholic, daily Gospel reflections from CatholicMom.com, Year of Mercy reflections from the Diocese of La Crosse, daily Mass from CatholicTV, and inspiration with Living the Good News from us here at Diocesan Publications.